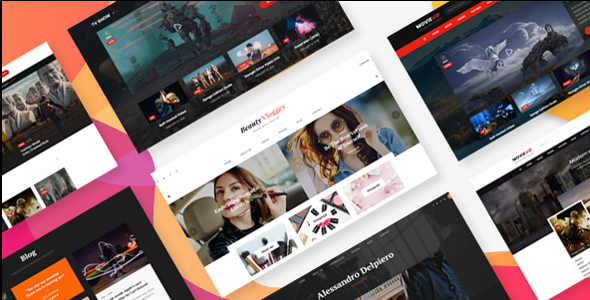 VidTube PSD is a unique & creative vlog PSD template for vloggers, film makers, youtubers, streamers and movie sharing sites or even personal blog sites. The theme comes with 4 modern and elegant, highly customizable vlog & film focus premade demos. The demos are amazingly gorgeous with tons of beautiful UI elements that could serve many purposes: a Personal Blog of a Vlogger, a website of a Film Maker or professional Photographers, or a movie sharing template for websites like Netflix, or even for a TV network website, etc. Our designers are creative artists who also are vloggers and work in the media & telecommunication field so we know what element should and shouldn’t be in a Vlog template. Therefore, if you are out looking for a great Vlog and Film template for your website, VidTube is definitely the right choice.